Esta viagem de um dia de Auckland para as Waitomo Glowworm Caves deixa você maravilhado com a luz cintilante emitida por pequenos vaga-lumes dentro das famosas cavernas da Nova Zelândia. Ande de barco pela Glowworm Grotto, onde seu guia descreve as fascinantes iluminações. No caminho, observe a terra arborizada de Waikato passar e veja os destaques da região, como Rangiriri. Depois, aprenda mais no complexo de visitantes Waitomo e desfrute de um piquenique opcional. Lance seu olhar sobre a iluminação estrelada de minúsculos vaga-lumes nas Waitomo Glowworm Caves, localizada a cerca de 2 horas de carro de Auckland. Comece sua viagem de um dia com a coleta matinal em seu hotel ou no terminal de ônibus em um ônibus confortável. Seu motorista aponta destaques enquanto você toma o cenário da Ilha do Norte a caminho de Waitomo. Viaje pelas terras bucólicas da região de Waikato e King Country e veja o histórico Rangiriri - local de uma batalha de 1863 entre as forças britânicas colonizadoras e os indígenas maoris. Na chegada ao Waitomo Glowworm Caves, embarque em um passeio de 45 minutos com um guia local. Siga a pé pelas cavernas de calcário subterrâneo e descubra como as estalagmites e estalactites foram formadas. Um curto passeio de barco desliza pela Glowworm Grotto, onde você pode admirar milhares de vaga-lumes que iluminam a câmara subterrânea. Após o passeio, aproveite o almoço (se a opção for selecionada) ou compre o almoço em um cardápio limitado no café no local. Tenha tempo livre para explorar as exposições no centro de visitantes antes de encontrar seu treinador para a viagem de volta a Auckland. 1. Took about 3 hours to get there and another 3 hours back TOTAL OF 6 Hours of sitting down in a crowded bus. 2. The cave tour lasted a mere 45 MINUTES of the entire trip! It gets worse! You ARE NOT ALLOWED TO TAKE ANY PICTURES IN THE CAVE nor do they show you what a glow worm actually looks like. 3. Once the tour ends you have 15 minutes to grab a bite to eat if there isnt a line, use the bathroom AND look around the souvenir shop before you have to hop back on your bus not enough time! 4. There was NO Wifi on the bus even though it clearly states that each bus has Wifi before I purchased tickets. Definitely was NOT worth almost 200. Disappointing. More time is spent on the coach than at the attraction. Save yourself the trouble of a tour and do yourself as you will get far more out of the day that way. The glowworm cave is beautiful. It's a long way out in the middle of nowhere, so I would recommend booking a multi-stop tour. Awesome experience but a little more time at the caves would be great. Felt a little rushed and would like to have stayed a little longer. The caves are fantastic. The tour was not. Get great photo ops of fantastical rock formations in the underground chambers - what opportunity? Photos were forbidden in the caves. 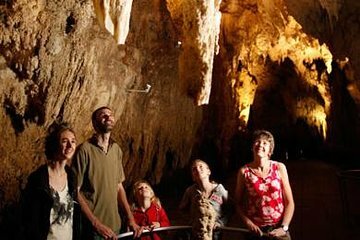 Have time to explore the Waitomo visitor complex at your leisure - we had about 10 minutes before the bus left. Have the option to pre-book a buffet lunch - lunch was a deli sandwich, apple, and a muffin in a box. In all, 5 hours on a bus to have a 45-minute tour through the caves. Combine this one with other destinations. We missed the pick-up and emailed the local tour partner to see if we can be accomodated next day, as we are flying out 2 days after. Local tour partner responded late in the afternoon informng us that their tour is full ntil mar 12, we will be gone by then. Too bad we could not reach viator to help us. We would have wanted to see this tour. So our payment was forfeited. Kinda dampened our vacation, but its our fault, we were late! Very beautiful place. Amazing to learn not only about the glow worms but also the history of the caves. Really cool to see the stalagmites that have formed over years and years. Seeing the glow worms is so magical. It's like looking up into space and seeing bright blue stars everywhere. Absolutely no photos allowed inside because it will scare the worms then their lights will go out for sometimes days. Thought the actual boat tour would be longer though, but it just takes you in a circle in one small cave where there's a huge cluster of worms. Still amazing to see, and the surrounding forest is beautiful as well. Really good tour, it is a very long journey from Auckland though. The bus driver going was good however the one on the way back was boring.... the tour I found was very expensive for a 45min tour!